Nigel and Christine invite you to come and explore the New Forest with Walking Picnics. We will lead you on a guided nature walk through the forest, pointing out the amazing wildlife and history of the place, then we will finish with a home-produced gourmet picnic. All this costs just £15 per adult, for both the walk and picnic. Get together as a group of six or more, and we can arrange a bespoke Walking Picnic for your party. Nigel leads the walks, which usually last about two hours, and we walk around three or four miles, stopping to admire the view. Nigel is a keen birdwatcher, with a good knowledge of the local flora and fauna. If you have a pair of binoculars, do bring them, as there are plenty of birds and animals to spot. We recommend strong shoes or boots, as we will be walking over rough ground, which can get muddy. Christine is in charge of the picnics, which always include some of her home baked bread and cakes, and also use local seasonal produce. We serve a three course picnic, with a light starter, home-made pies or quiches, and a choice of cakes or puddings. Our Summer season of regular walks run from Easter to the end of September, and at other times of the year we run occasional Souper Walks, or special events on request. As we prepare all the food specifically for each picnic, please reserve your place by 9am on the day before! We are now taking bookings for our 2019 season of Walking Picnics, with a varied programme of themed walks which anyone can book onto. We start with a Birdsong in Spring walk, on Saturday, 13th April, and have a different theme each month. See our Dates of Walks page for more details. ​We will also arrange a bespoke private Walking Picnic for your celebration or group, for a minimum of six adults. Please contact us to discuss your needs and dates. Our Dates of Walks page has details of our programme of Walking Picnics for the Summer of 2019. We have a range of different themed walks, all lasting around two hours, and each picnic will include a home made three course meal on site. These events are open for all individuals to book onto, and cost £15 per adult, or £8 per child. We limit numbers to a maximum of 12 people, and are happy to take reservations now. See our Dates of Walks page for full details. In addition to the programme of themed walks which anyone can book on as an individual, we are offering to arrange private walks for any group of a minimum of six adults. So, find yourself a few friends, and have your own Walking Picnic - we can make sure it fits your needs, and make sure the picnic includes some of your favourite food. Send us an email with what you are looking for, and we'll discuss with you what we can offer. ... and there are always cute New Forest Ponies, too. As a member of the New Forest Marque, Walking Picnics supports local producers by buying from recognised local New Forst suppliers. We are very pleased to be part of this group of local producers and services, as we always try to promote the New Forest locality and the wide range of locally produced foods available. 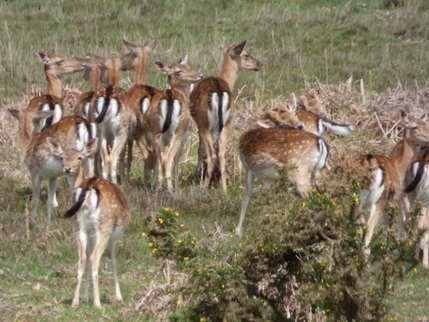 Ask us for a Directory of New Forest Marque producers when you come on one of our walks. You can find out more about the New Forest Marque and all the other local businesses who have also joined by looking at their website. The New Forest Marque is supported by the New Forest National Park Authority.